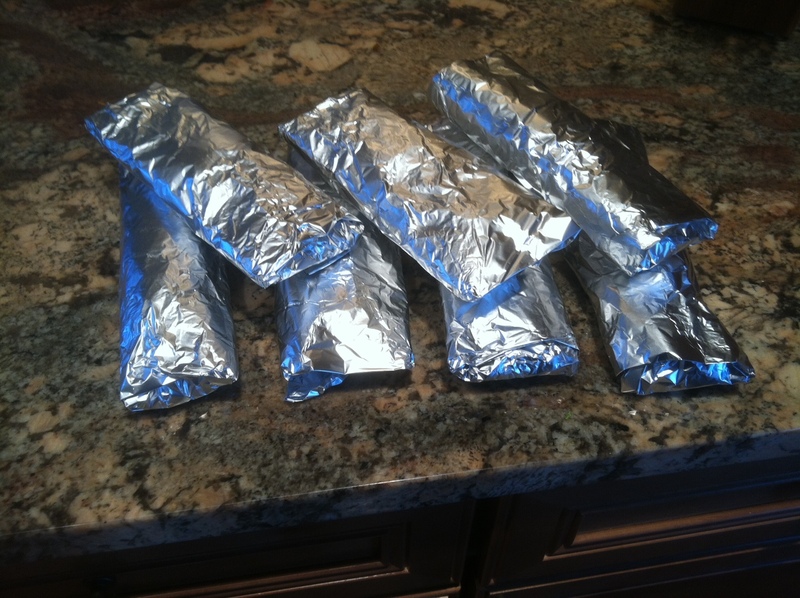 While the concept didn’t have to come from a rocket scientist, I certainly hadn’t thought of it before: pre-make a handful of burritos on the weekend and freeze them for a handy lunch. Before I left my weekend at Mom’s place, I decided to try the concept out and leave her a few ready to eat lunches. 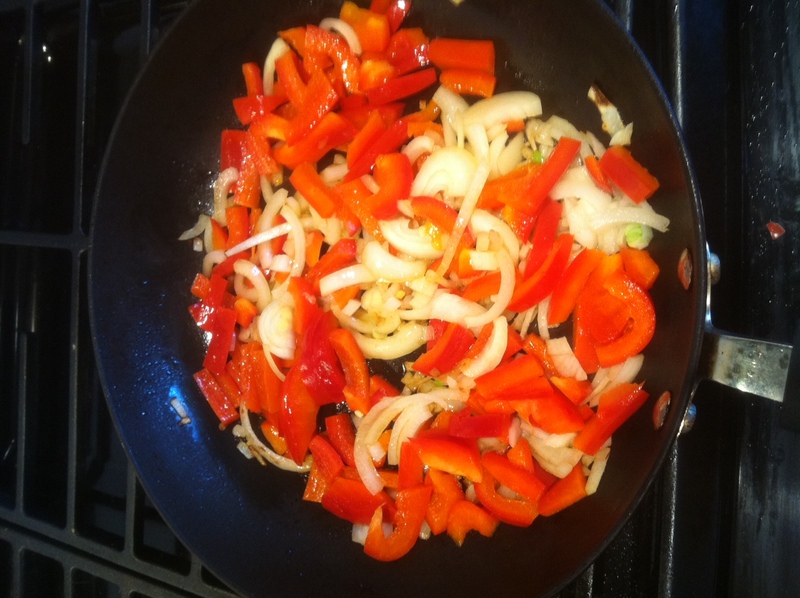 The first step was to dice the onions and peppers and saute them in a small amount of olive oil. 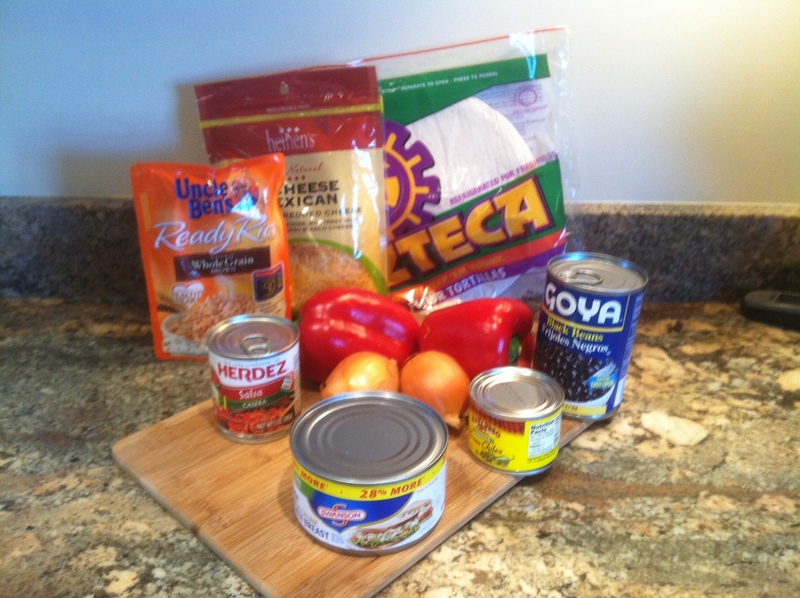 Next, I drained the beans and as much fluid out of the salsa as I could (a can? really?). I mixed the chicken with about 1 T of the southwestern spices and heated up the rice bag. Time now to assemble. A sheet of foil, a tortilla and a scoop (large for chicken, beans, rice and peppers/onions and small for salsa and chilies) of each item. Add a sprinkle of cheese on top. Roll the contents and fold in the sides. 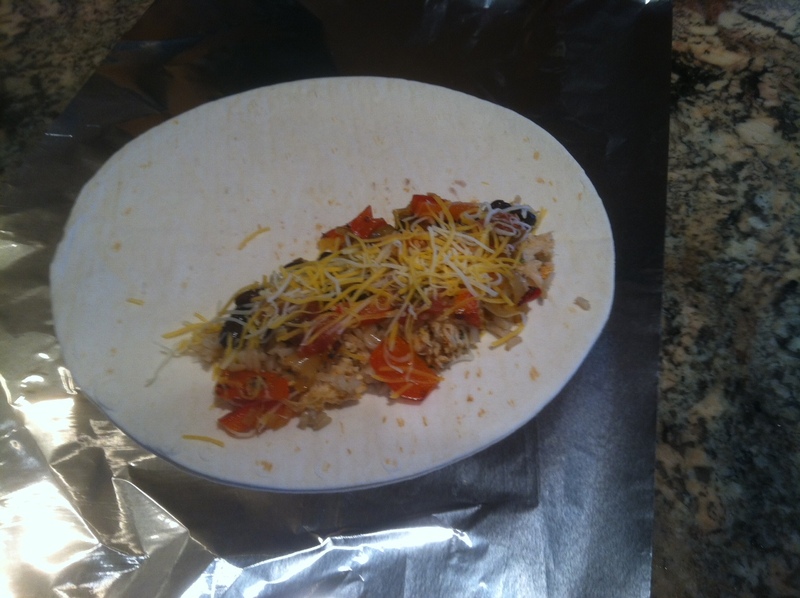 Roll the burrito in foil, again wrapping the sides. 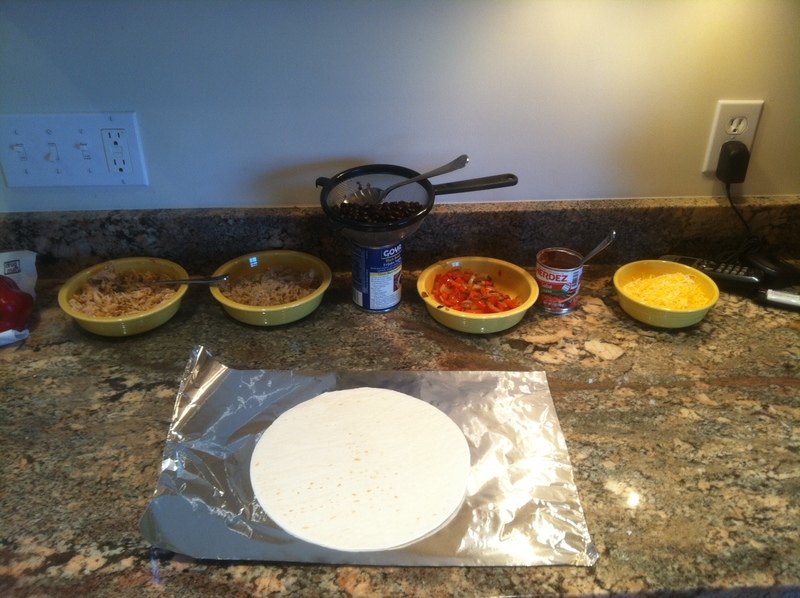 The process yielded eight burritos (one in the fridge and seven destined for the freezer). To reheat the frozen burrito, remove the foil, sprinkle with a very little water, cover and microwave on high for 2-3 minutes. So delicious and easy to make. Nice. I have a backpacking trip coming up. Freeze a couple of these and eat them as they thaw in the pack perhaps. I was the lucky mom who ended up with these in her freezer! It was SO nice to not even have to thaw a head of time. Healthy and delicious! . . .and so nice not to have to cook for myself. Have enjoyed your “rants” tremendously. Tonight I’m making the scallops. I like the way you describe (and picture) everything. I didn’t know about dry scallops and I’m so glad you taught me. BTW, I still use your cheesecake recipe every holiday. Oh man…..now I have to make the cheesecake…..
MMMmmm. Chipotle. I LOVE chipotle. The best chipotle I’ve found to date comes from a little souvenir shop right next to El Santuario de Chimayo just north of Santa Fe, New Mexico—a place called El Potrero Trading Post. In fact, I get all my chili powders there. By the way, speaking of chipotle, try it in your meat rubs for everything from brisket to ribs to even baked chicken. It imparts just a hint of smokiness that belies the fact you made it in the oven. People will swear you used a smoker, but you won’t have all that hassle. I really like this idea. As you say its kind of obvious – but I never thought of it. Mind if I add a link to this, I might try a variation of it myself? Please do and let me know how they turn out. We usually “cook ahead” our meals for 2 to 3 days to save time and resources, and to make sure we have home-cooked food readily available at home in case anybody gets hungry. I’ve got 3 young kids and I discovered early on that cooking time gets drastically reduced when the number of small kids in the home increases. Having to buy food outside is not really our style unless I’m in a hurry.